This month, we’re giving into our deepest desires! Yarn this sinfully gorgeous could only come from Forbidden Woolery! Leann Ross dyes yarns inspired by the seven deadly sins and is introducing her newest yarn, Gluttony Sock. An 80% Superwash Merino and 20% Nylon blend, Gluttony has a delicious 435 yards in the 115 gram skeins. We’ve chosen a yummy palette of colors that show off the rich tonal variations Leann creates. We’ve paired this yarn with a gorgeous cabled design from K.M. Bedigan. Vyner is available in your Yarnbox library now! Free Pattern Friday- These socks are toe-up from the flo up! These Pole Dancer socks by Gabriela Langer are grooving so hard they "Toe up" the dance floor. This Pole Dance is a sock with an unusual construction, originally designed by Krysten, Hypercycloid. This pattern is merely an adaptation of the original design from cuff-down to toe-up. Toe-up version developed by Alpine Adventures. Please be aware that this pattern needs the original pattern, too.The instructions for the heel are given in the original pattern (Pole Dance), which can be downloaded for free. You might want to visit Krysten’s storeHypercycloid Designs to have a look at her other patterns! So there are not a lot of crochet socks out there HOWEVER these "Outdoor Crochet Boots" by Ann Mancini-Williams caught my eye! It is not often you find such prettiness for combat boots! You can use any variegated or striping yarns to create these. Love! Free Pattern Friday: Hats off to you. I love both of these patterns for a spring! The open work on them make sure you don't get overheated in the lovely spring weather. I love wearing hats all year long! I think it makes me look cute! And these hats are CUTE! 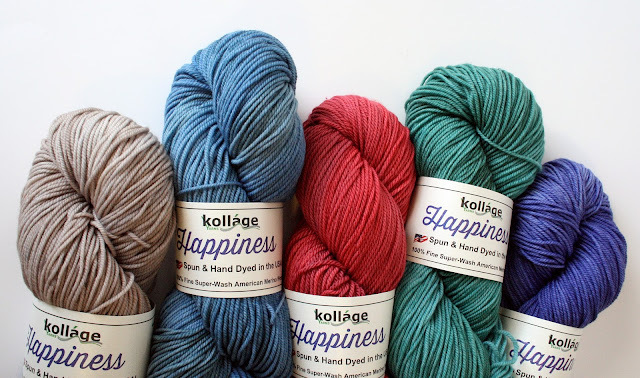 April's Classic box delivery of Kolláge Yarns bringing you even more happiness than normal. Your joyful skeins of Happiness DK are spun and hand dyed here in the USofA. Susan Moraca of Kolláge Yarns hand dyes each in beautiful tonal shades giving depth to each stitch. Happiness DK is a plied, 100% Merino Wool yarn and, at 300 yards per skein, you’ll have 600 yards to play with. Let me tell you…the squish…ohhhhh the squish…you’re going to love it!! We partnered with two amazing designers whose names you may recognize! Our very own subscriberGabrielle Vézina created the Inglenook Shawl. It’s a fun, textured shawl that picks up the subtle tonal changes within the yarn. On the crochet side, we worked with one of my favorite designers :) Julie-Sarah Desjardins (aka ACCROchet) designed the Orchard Shawl, a Tunisian crochet design with an open lace border. You’ll love the stitch definition the Happiness DK gives this pattern. Both will be ready for you to download later today! Which color is your favorite? I love them all!! Time to stalk your mailman! Edited to add pattern links. Free Pattern Friday: Reversible Round up! It's free pattern Friday! There are two sides to every story. Well there is also two sides to these stitched up beauties. 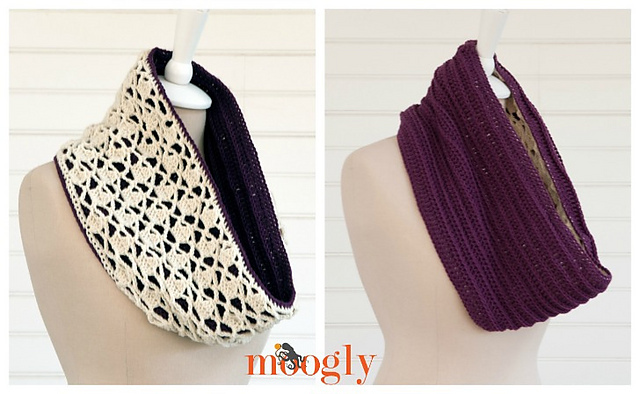 Check out these reversible cowls in both knit and crochet. Bee Keeper's Cowl by Grace Akhrem: This knit cowl is a great spring or fall piece to keep the cool breeze off your neck. Knit in chunky weight wool. you can change the gauge of yarn and add more stitches easily. It is a repeat of 4sts. Super fun and easy if you are not afraid of K4tog. Thank you @Whitedahlias for the use of your photo! You’ve asked and we’ve answered! One of the most common suggestions we get at Yarnbox is a box just for sweaters and this month we’re bringing you the very first Yarnbox Sweater! This special edition box begins with Malabrigo Rios. 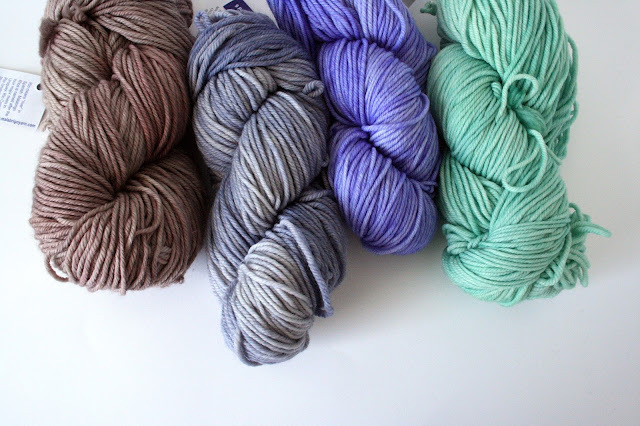 Rios is a 4-ply, machine washable, hand dyed merino wool. It is resistant to pilling, has great stitch definition and a soft hand- making it great for garments. Malabrigo is a small family owned yarn company from Uruguay. They work hand in hand with a cooperative of women producing a range of exquisitely soft, hand dyed yarns that are a joy to work with. We’ve selected eight rich semi-solid colors for every taste. To complement this great yarn, we’ve teamed up with designer Ela Torrente, who designed the Semilla Sweater. Named after ‘seed’ in Spanish, Semilla features a timeless V-neck raglan shape with a broken seed stitch pattern and stockinette sleeves. This v-neck pullover is flattering, stylish and a great edition to your wardrobe. The pattern is great for a first-time sweater knitter or a seasoned veteran. 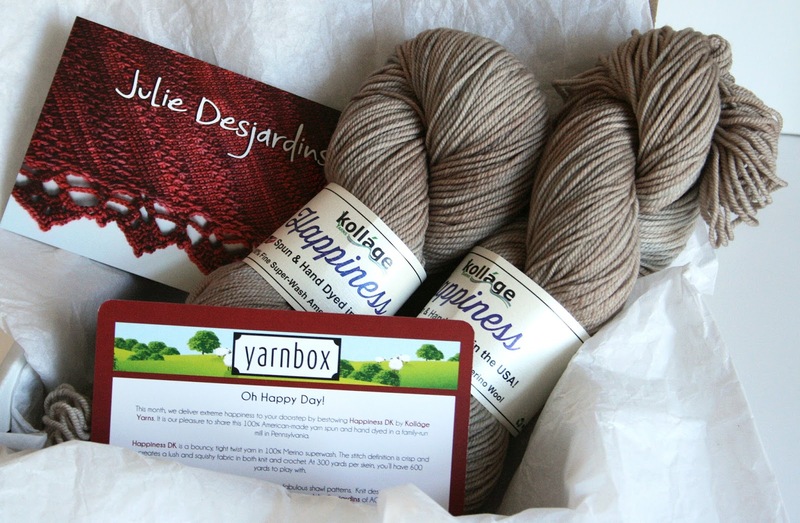 Designer Katy Petersen is also offering a special deal with the box for 60% off her Burnside Cardigan design that can also be created with this box’s yarn. 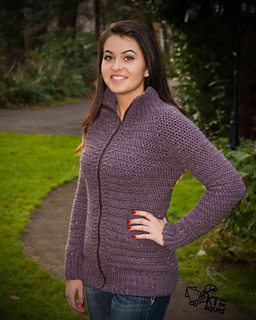 This cardigan is worked top down and can be finished with either buttons or a zipper. Ready to take the plunge? Yarnbox Sweater is available starting at $69.95. 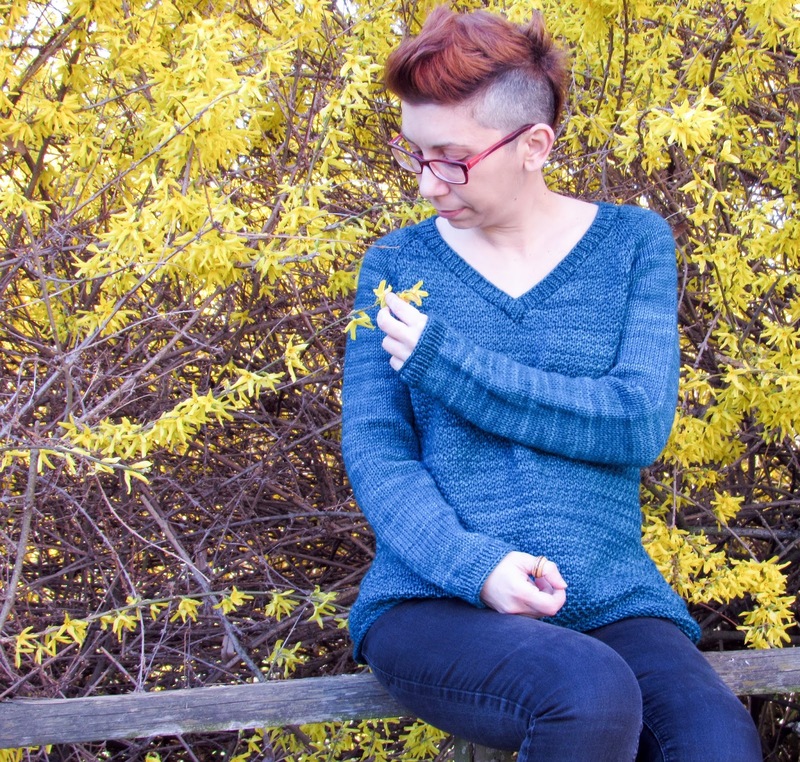 You can order your Yarnbox Sweater here then join in for the KAL! I hope you’re all in knitting mode! HAHA! April Fool’s! We’re ALWAYS in knitting mode! And that’s what makes this month’s socks perfect with ModeKnit! Annie Modesitt is a knitter, dyer, blogger, writer, teacher, designer, et cetera…et cetera…and the creative power behind ModeKnit. We had the pleasure of meeting Annie at STITCHES Midwest last year and knew that we just had to introduce her to all of you. This month, we’re featuring ModeKnit’s ModeSock, a blend of 60% Merino, 30% Bamboo and 10% Nylon giving you 382 yards of soft yarn with an amazing shine. Paired with this month’s yarn is Wake sock pattern from Lori Law. This is a fun pattern where the socks are fraternal and mirror images of each other with its fun rippled cables that look great in this yarn. This pattern is ready for download! Time to start planning our projects! 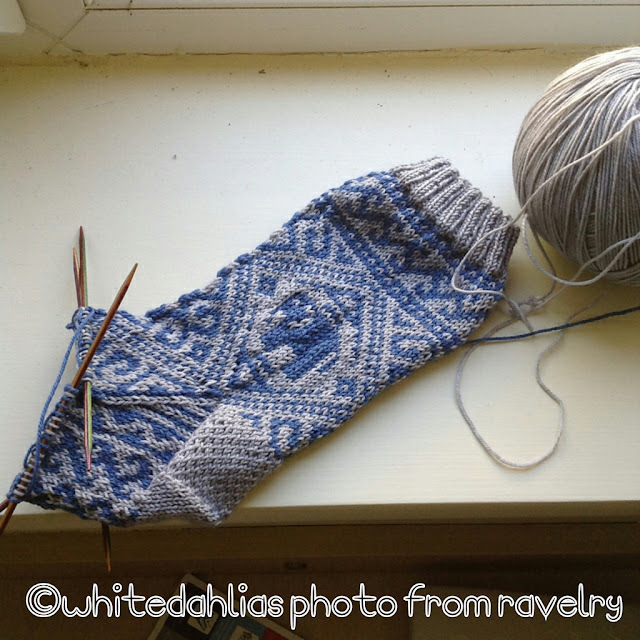 Updated: Blue colorway considered bright or muted and link to the pattern. Free Pattern Friday: Leaf it to me! With the weather warming up in dribs and drabs, the budded leaves are finally showing! So in honor of the greenery we are doing leafy patterns for today's Free Pattern Friday feature. New for this season, knitty has a great leafy short row collar, Pincha by Pinpilan Wangsai that I would love see knit up in last month's Sock Box; Mode Knit's- ModeSock 60% Superwash Merino/30% Bamboo/10% Nylon. I would do this in the Edinburgh colorway which is a muted Green/Gray. It would work up great in Baa Ram Ewe, Dovestone DK- 100% British Wool from our February Classic Box. Sticking with the green theme the Bramley Baths. I don't know about you, but I am so excited about spring! The flowers are blooming! My Lilac bush is budded and so fragrant! In grade school I devoured the book "Secret Garden" and since then I have always wanted an English-style garden. Last month the talented Iris Schreier managed to capture the essence of this in yarn and with an amazing pattern. This exclusive designer box is like no other featuring specially selected fiber and colors for a special design just for our members. Iris Schreier of Artyarns has taken this gardenscape inspiration and put it into her gorgeous fibers for this fourth edition of Yarnbox Plus+ Artyarns. She has created for us the Gilded Age Shawl kit featuring the beautiful Merino Cloud yarn and a bit of sparkle with Beaded Silk & Sequins. Pattern Link here. With her Gilded Age Shawl design, Iris takes us back to the Victorian era where tea garden parties were first held in the lovely gardens of Britain. Worked with rows of lace, garter and stockinette, this is a fun and pleasurable project you’ll enjoy knitting. The pattern is ready for download! A huge thank you to our very own KanKnitKing for pattern testing this for everyone in the Coralbells pictured above! 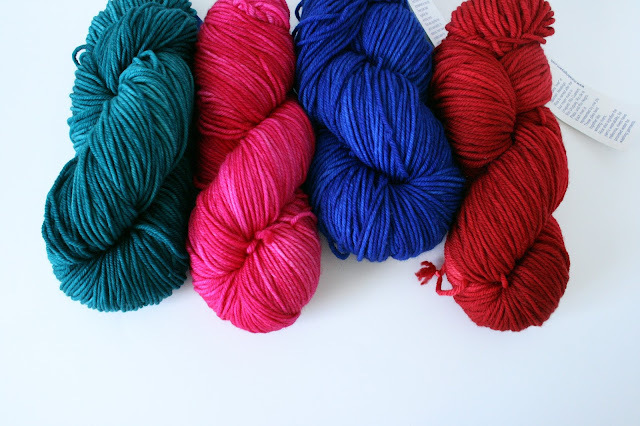 There's still a chance to purchase a Yarnbox Plus+ Artyarns box of your own in any of these three blissful color sets. They are currently available in our Overstock Shop. Choose a kit in your favorite color or purchase additional sets and collect them all! 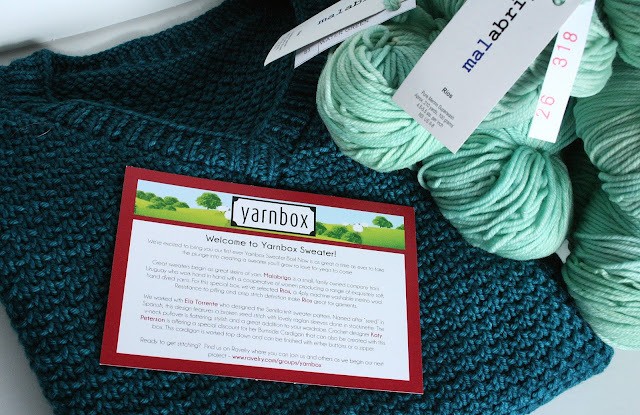 Click here to get a Yarnbox Plus+ Artyarns subscription of your own!